It was the kind of game that's difficult — impossible, maybe — to move on from. The University of Wisconsin women's hockey team had spent the entire 2016-17 season atop the national polls, gathering every team trophy in its path behind a Patty Kazmaier Award-winning goaltender. And the Badgers outshot their Frozen Four championship game foe by more than a 2-to-1 ratio, generating chance after chance to complete the hardware haul. Yet they watched Clarkson celebrate on the ice in St. Charles, Missouri, two years ago Tuesday, a result that defied belief to some on the Badgers' side. You can probably imagine, then, what came to mind for veteran Badgers players when they learned Clarkson again stands between them and the ultimate goal. UW will face the Golden Knights in the Frozen Four semifinals on Friday in Hamden, Connecticut. "For the people that played in that 2017 game, it's important," senior forward Annie Pankowski said after UW's 4-0 victory over Syracuse in Saturday's NCAA quarterfinal. "And we feel it. We looked at who won (Clarkson's quarterfinal against Boston College) after the game, and everyone was like, 'All right, let's go. We're ready for this.'" The Badgers had to live with the sour taste of falling short in the final game of the 2017 season despite outshooting Clarkson 41-20 and generating a breakaway, a 2-on-1 rush and a goal that was waved off for interference. UW had the season's top player in women's college hockey in goaltender Ann-Renee Desbiens but couldn't get her any offensive support. The 3-0 defeat came despite the Badgers' top line of Pankowski, Emily Clark and Sarah Nurse producing 18 shots on goal. Pankowski made it clear the UW players remember the feeling of being shut out with the biggest prize on the line, but it's a different season and a different background in Friday's meeting. 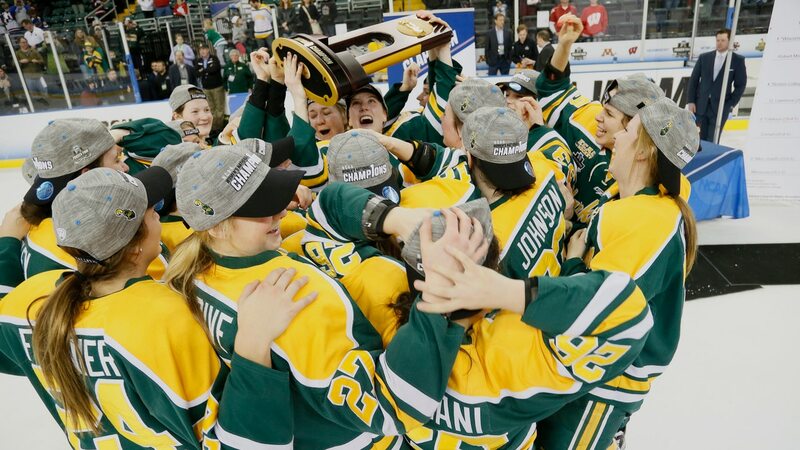 Clarkson successfully defended its 2017 title last season, becoming the first team to win three overtime games in the NCAA tournament. It added a fourth straight on Saturday when Elizabeth Giguere scored in an extra session to beat Boston College 2-1 in the quarterfinals. Giguere and linemate Loren Gabel are the country's top two scorers, with Giguere having 73 points and Gabel 40 goals. Gabel and UW's Pankowski are two of the three finalists for the Patty Kazmaier Award, which will be presented on Saturday. "Just watching them play this year and seeing those top players who are putting up a lot of points, you're excited for that challenge," Badgers goaltender Kristen Campbell said. "I know that this team is more than ready to take on those players. I know that we can shut them down and reach our final goal of getting to that final game." The Golden Knights (30-7-2) have a power-packed top line, with center Michaela Pejzlov completing a trio that has combined to score 85 goals — more than the total of 21 of 40 Division I women's teams. But, having played against both teams this season, Syracuse coach Paul Flanagan gave the Badgers (33-4-2) credit for having more depth. The Orange lost 6-2 and 4-3 in overtime in an October home-and-home series with Clarkson. UW beat Syracuse 6-1 and 9-1 in December before Saturday's NCAA victory. Clarkson has proven it knows how to win tight postseason games, Flanagan said. "So they're battle-hardened when it comes to NCAA competition," he said. "But I do think that (Badgers coach) Mark (Johnson) has an advantage with his depth. So with that depth, the overall team speed is a lot, lot better. Gabel and Giguere are really fast and really talented, but there's a lot more weapons here." The other Frozen Four semifinal also matches a team from the Western Collegiate Hockey Association (Minnesota) with one from ECAC Hockey (Cornell). The Big Red is the only team that advanced through the quarterfinals with a road victory; Cornell defeated Northeastern in overtime. With the exception of Minnesota and Northeastern, Syracuse played against five of the other seven teams that made the NCAA tournament this season. Flanagan said the Badgers were the best team they faced. "I keep going back to the way Wisconsin works and how fundamentally sound they are," he said. "You work hard, you're fundamentally sound and you've got a lot of talent, that's pretty scary. I would be really surprised if they're not hoisting the trophy next Sunday."